Cartridges Filters are made from a group of very useful elements of which individual operation is not possible for filtration but combined correctly can increase the effectiveness of filters and strainers. Filter which is made with cartridges elements have filtering surface at the outer layer of the cylinder. Filtration through this type of process can eliminate even undersized solids. Basically, liquid flows between thin disks, assembled in a stacked form, opening in a central shaft which supports the disks, and impurities are stuck between the disks. This disposable filter holds the highest market share in the world. First introduced in the US market in the 1930s and made from woven wire mesh core bounded by cotton yarn. The yarn was the tightly twisted medium which in future took mold into diamond shape. In early 1970s new synthetic media like polypropylene became well-liked as they offered the wide range of chemical compatibility and resistance to growth of a microorganism. Further, cotton yarns were replaced by “roving” (textile fibers) due to its lower cost and increased filter life. String wound filter cartridges have an effective and larger surface area than meltdown filter which can categorize String wound filter in depth filter. String wound filter is one of the most used filters due to its supply of an inert polypropylene spun yarn. This type of yarn has an edge over other due to its characteristics like more volume of air, greater twist, random fiber arrangements and round-cross-section. Yarns can be produced with different techniques like ring spinning system but properties like compactness & hairiness is a great influence on yarn production as it’s concerned with the filtration process. Despite being low cost and merits they offer, String wound filter cartridges have disadvantages like media migration and chemical leaching which can hazardous to health if instruction regarding the cleaning of cartridges is not followed correctly. Melt blown filter cartridges are also adept type filter which is best for eliminating uniformed size particles from a liquid. They were developed after String wound filter cartridges as a low-cost substitute. They are made using one-step process in which they are pressurized with high air, blows the molten polypropylene resin from a mandrel forming layers of a self-bonding web. These layers of fiber can be separated easily. Melt blown cartridges are not suitable for industrial filtration process; they break down even with differentiated moderate pressure. But they are advantageous over string wound cartridges in terms of freedom from the chemical process. Regardless of these disadvantages Melt blown cartridges are the least expensive and widely used filter in commercial and domestic applications like RO systems, compatible with most chemicals and can tolerate temperature up to 80° C. It also has relatively high dirt holding capacity and longer life. It also can be installed upstream or downstream for general purpose filtration. These filters have the greater capacity of holding particles than other filters mentioned above. It is possible due to its fully automated manufacturing process where pure polypropylene microfibers are thermally bond to first, lower density outside surface then gradually, higher density towards their center. Hence, creating a high void volume and a consistent quality product. Spun-bonded cartridge filters can be used for industrial, pharmaceutical food/beverages, water, chemical process, cosmetics etc. as pre-filter or final filter. Their capacity to capture particles throughout the entire cross section is advantages in terms of longer life as changing of filters can be avoided for the considerably long time. The higher flow rate is achieved with low pressure drop out in micron range which reduces fiber migration. The manufacturing process of these filters does not use any chemical contamination. They are easily disposable and are silicone free. These cartridges are made up of textile fibers and a resin-like acrylic fiber with phonic resin or cellulose fibers with melamine resin. Through this combination, a rigid pore structure is obtained which can withstand extreme temperature and viscosities without collapsing or be being compressed. A coarser particle is trapped on the outer layer of the filter while the inner matrix captures smaller particle. Its application is in the alcohol industry, cosmetic and pharmaceutical industry and others. Resin-bonded cartridges filters can withstand high temperature up to 120° C and high-pressure differentials up to 35 psi. They are available in nominal rating and absolute rating. A Pleated-filter cartridge consists of many layers which enable it to capture the different size of particles in terms of their micron rating and without being resistant to larger particles. The center of this cartridge is punctured followed by internal wire mesh support. Protecting the second layer, an internal nonwoven layer is placed, followed by external wire mesh support on the outer most surface. Which makes handling of a filter is easy. Due to its structure, micron rating of particles is more precise than a string-wound cartridge filter and melt-down cartridge filter. Despite being more expansive than the latter two, pleated filter cartridges are the only choice for submicron filtration in range of 0.1 -0.45 µm. These cartridges are applicable to the production of high-purity and sterile water. 1-50 micrometers type filter can be installed on the vent of water tanks which prevents airborne particles from entering the tank. Submicron post-filter can be applied for the critical application like liquid, sensitive to particles or microorganism. These are not the typical cartridges filter described above but is a device to effect chemical changes in water. 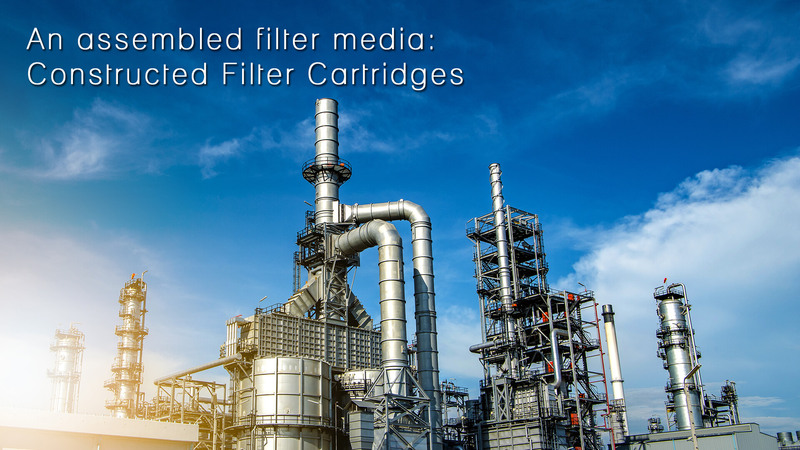 Through media cartridges flow rate is lower than other same sized particle filters. Carbon-based media cartridges should be changed every three months or more often. Deionizer (DI) type cartridges should be changed based upon water quality. Calcite media filters are used for neutralization of acidic water, activated carbon for removing chlorine, taste or odor from water or any other liquid. Various types of media filters used in a market are mostly for the purpose of removing odor. Other than these, there are several other filter types are available in the market, based upon their material and structure. It also depends on the practical implication. The filtration process is mostly used for water filtration like RO system and Oil filtration for purifying different kinds of oils like edible oil, lubrication oil etc.